It’s become a fixture of any Apple conference involving the iOS devices that there will be some chart explaining how it’s a bigger portable gaming platform than anything from Nintendo or Sony, and more often than not it’s laughed off. Just because a phone and/or MP3 player plays games, that doesn’t make it a games console, after all, no matter how impressive the numbers might be. With yesterday’s release of iOS 4.1 and with it Game Center, Apple’s made quite a significant move, issuing an admittedly limited but still promising gaming network, and the first on a portable gaming system that comes close to the ubiquity of Xbox Live and PSN. It’s arguably even more so, given that you have an essentially permanent connection through which to manage your friends and achievements – the current PSP and DS hardware wouldn’t be able to equal it in that respect even if they tried. At this early stage Game Center is pretty bare bones, below even existing third-party attempts like OpenFeint and Plus+ in features and support, but it’s the ubiquity that makes it a big deal. That and the fact that it’s really Apple’s first ever move into the gaming market. 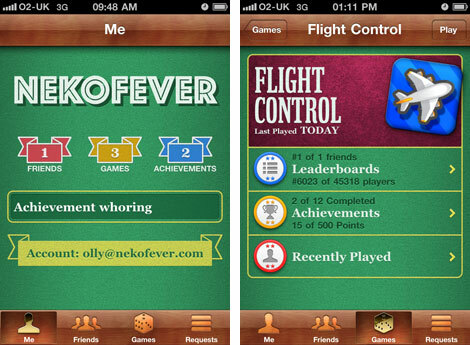 Now every one of those 230,000 new iOS devices activated each day has a bona fide gaming network built in, and although not everyone will use them for games, the 120 million iOS devices sold since 2007 shits all over the records of any console ever – going by these figures, only two consoles have ever exceeded that mark, and both of those did it with more than a decade on the market. Many gamers will, of course, never take it that seriously. Gaming on iOS is a secondary feature, and it’s a secondary feature on a portable, which some stubbornly refuse to give the credit of the ‘real’ consoles no matter what huge franchises turn up on them. I can definitely see that perspective for iPhone games, as many attempts to cram existing games onto the touch controls make early attempts at putting an FPS on the PSP feel like a mouse and keyboard, but it’s still the first go-anywhere system with an always-on Internet connection and a proven digital distribution model – it’s the kind of thing that only a few years ago we’d fantasise about future consoles doing, and it got in by the back door. Is the iPhone going to kill the 3DS before it even gets to market? No, of course not. It’s going to be a serious player, though; I’m sure of it. It’s already everywhere, it’s been shown to be a graphical powerhouse, and games are dirt cheap. You won’t see its impact in the charts, which makes it something of an oddity, but expect impressive graphs when Steve Jobs steps out on stage in January.